Five years ago Blue America endorsed a long-shot candidate for Congress against an entrenched powerful congressman and we ran the video above. When he first ran we described his opponent, Sylvester Reyes as a moderate, garden variety Democrat-- except in matters of war-- where he was, in effect, really a Republican. Reyes' campaign, oddly, tried to paint the progressive O'Rourke as a Republican. He claimed that O'Rourke wanted to "change" Social Security. And it's true; O'Rourke did-- in the same way that all progressives want to change it-- shoring it up by raising the income cap so that the wealthy pay their fair share. The youthful-looking Beto, then 39, was the guitarist and singer in El Paso-based Foss, a popular local EMO/grunge band. In 2006 he was voted "Best Elected Official" in El Paso's weekly paper, What's Up, with the mayor coming in second and Reyes coming in third. It was a real David vs Goliath contest. The entire Democratic establishment rallied behind Reyes, powerful-- if somewhat doddering-- chairman of the House Intelligence Committee, long before Devin Nunes. Beto was best known for being pro-pot, anti-war on drugs and for fighting crackpot xenophobes. In the primary, all the big guns came out for Reyes-- not just Pelosi, Hoyer and both congressional and K Street heavyweights but Bill and Hillary Clinton and Barack Obama as well. The only outside group coming to Beto’s aid was Blue America. But it was his field operation and local outreach that won him the election. The distant and out-of-touch Reyes spent $1,350,486 on his primary battle with O’Rourke who spent only $618,526 for the primary and the general election combined. In a 4-way primary, he won 50.5% of the vote to Reyes’ 44.4%, avoiding a primary runoff and going on to beat Republican Barbara Carrasco with 65%. The Republicans haven't bothered to run anyone against him since. Beto has been one of only 6 members of Congress who doesn't take PAC money. Friday he announced he's running for the U.S. Senate seat currently held by Ted Cruz, who, among other things, is one of Congress' most notorious PAC-abusers. In August, PPP surveyed Texas voters about Cruz and he looked pretty unpopular and possibly electorally vulnerable. PPP's new Texas poll finds that Ted Cruz has become unpopular in the state, and he could be in trouble for winning the Republican nomination in 2018. Overall only 39% of voters in the state approve of the job Cruz is doing, to 48% who disapprove. It was already clear from national polling that Donald Trump had come out ahead in his feud at the GOP convention with Cruz, but we find that even in Texas 52% of Republicans now say that they prefer Trump as their nominee this year to only 38% who would go with Cruz. The skirmish with Trump seems to be contributing to an overall weakening of Cruz's position with Republicans in the state. Only 50% of GOP voters say they'd like Cruz to be their Senate candidate again in 2 years, to 43% who say they would prefer someone else. He hovers right around that 50% mark in hypothetical match ups against both Michael McCaul (51/19) and Dan Patrick (49/27). Against Rick Perry though, who shares Cruz's universal name recognition, Cruz faces a 9 point deficit at 46/37. • 89% of voters in the state support background checks on all gun purchases, to only 7% who oppose them. They're supported by 94% of Democrats, 91% of Republicans, and 80% of independents. • 83% of voters in the state support barring those on the Terror Watch List from buying guns, to only 10% who are opposed. That's supported by 85% of Republicans, and 82% of both Democrats and independents. • Voters in the state support an assault weapons ban, 48/43. That's because Democrats are far more unified in their support for one (70/21) than Republicans are in their opposition to it (34/55). • 72% of voters in the state support increasing the minimum wage to at least $10 an hour, compared to only 14% who think it's fine where it is now, and 11% who would like to eliminate the minimum wage altogether. A minimum wage hike to at least $10 gets support from 94% of Democrats, 74% of independents, and 53% of Republicans. The same poll, though, showed Cruz still beating Julian Castro, who has talked about running [as has his twin brother Joaquin], with a double digit lead-- 48% to 36%. Beto, a far better candidate than either Castro, wasn't polled. He will be soon and this isn't going to be an easy race for him or any other Democrat. The last time a Democrat won a Texas Senate seat was in 1988 when Lloyd Bentsen-- first elected in 1970-- was reelected. The Democrats have lost every Texas Senate race since then. Beto sat down with Abby Livingston of the Texas Tribune to explain how his brand of retail politics-- in a state with 7 major media markets no less-- will break that trend. [Did you read the post Melody wrote yesterday about the uselessness and dysfunction of professional digital media consultants?] Beto, wrote Livingston, "has no pollster and no consultants at this point, and said he has no interest in hiring operatives of that ilk." ...In a conventional campaign, O’Rourke would try to raise somewhere in the ballpark of $30 million in federally mandated $2,700 increments. Then he would turn to the campaign committees and beg them to invest millions more. But the national Democratic committees are overtly telegraphing that the priority in 2018 is to protect the 10 party incumbents who represent states Trump carried in 2016... Nationally, Democrats have no appetite at this point to spend serious money in Texas, and O'Rourke is not accepting money from political action committees. Yesterday someone asked his campaign for a comprehensive list of positions on issues. The response was a page from the nonpartisan website OnTheIssues, where has his record on everything from his stand on abortion-- he's pro-Choice-- to welfare (a vote to maintain the food stamps program. He and Cruz are on opposite sides of virtually every issue that faces the country. Texas' other senator, John Cornyn told Politico he knows Beto. "And he's a good guy. But I think this is a suicide mission." Blue America knows he isn't and, like we did in his congressional race, we've endorsed him. 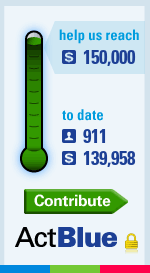 Please consider contributing what you can by tapping on the Senate thermometer on the right. There's an opportunity to do better for Texas and better for this country. To move past the anxiety and fear, the walls and the refugee bans, and strongly and confidently work together on bringing this state and this country together on jobs, on improving our immigration laws, and on ensuring that we have a Senator working full time for Texas. During my time on the road traveling across Texas, meeting with folks like you in communities from El Paso to Houston, Wichita Falls to Laredo, and everywhere in between, I've seen that you are not discouraged by what's happening. You're more fired up than ever before. We cannot wait four more years until 2020 and hope that we're able to elect a president to replace the one we have now. We must work together now to elect a Senate that has the guts and the grit to fight back against the White House and win. Here's the quick math: the balance of power in the Senate right now is 52 Republicans and 48 Democrats. If we hold on to the seats we have, and if we pick up a few more-- including Texas-- we won't just change what happens in our state. We'll change the direction of the entire country. This is something we can only accomplish if we work together. We're going to fight like hell and run like we have nothing to lose. Our campaign won't be "politics as usual." I'm going to get started today on meeting with folks in counties across the state-- including the ones that aren't typically Democratic strongholds. I'm going to meet with Texans in Odessa and Midland and Big Spring and Lubbock. Because that's the only way we're going to do this the right way. Beto's 44 now and he says he just wants to serve the state of Texas, not-- like Cruz-- use it as a springboard to a presidential run. He's also all for term limits-- as he said he was when he run for the House. In an interview with the Dallas Morning News Friday, he said he's "under no illusions this will be anything but hard in a primary and anything but hard in a general election. Nothing I’ve ever done that’s amounted to anything has been easy. My heart’s in it, I want to do this, I'm driven to do it. I'm not poll--testing it. I'm not consulting with consultants." Comparing the Senate race to his unlikely win in El Paso, he said that "What we’re doing now is going to be very similar on a much larger scale and is going to be that much tougher. But we’re ready for it." Friday Beto was in Dallas and yesterday he was in Waco and Austin. He's been out meeting people in every corner of the mammoth state for several months. 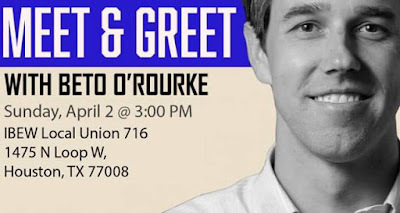 This afternoon he'll be in Houston, the biggest city in the biggest county in the state-- a county where Hillary beat Trump 706,471 (54.2%) to 544,960 (41.8%). If you can, try to make it to the event and get to know him. He's the key-- virtually the only plausible key-- to wresting control of the Senate away from Trump's puppet GOP. Suicide mission is not that far off. I've related before something I was told by one of the good people in TX (there aren't that many). Even when a race is between a sorry waste of carbon, like cruz, and a bright shining star, if the star has a D beside his name, voters just cannot make themselves do it in the booth. It's pavlovian, reflexive, conditioned by decades of peer violence and church admonitions. They'll always vote for the R waste of carbon. Also, he is wasting his efforts if he thinks he can claim cruz isn't doing TX justice as senator. A senator's job is NOT to serve his state. It is to serve his party's big donors and doctrines (hate, fear, greed...). Everyone knows this. Anon's point should be well taken. As a Houston (former) Democrat, I'll probably wind up voting for Beto, but I'd feel better about it if he would hurry up and sign on as a co-sponsor to Conyers' Medicare for All bill. And he only has a shot at winning in November of 2018 if Matthew Dowd gets in the race as an independent and peels off about 10% or more from Poop Cruz. 2016 Election has shown that ppl starting to pay attention now. Ppl are showing up at townhalls in record numbers and in record numbers, registering to vote for the first time. 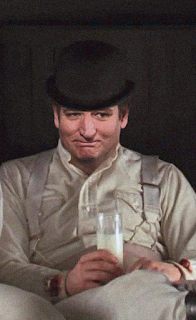 The complacency there before is no longer there and Cruz should be worried about that change. Cruz cannot win in the big cities and when the big cities turn up, he's done. Hillary won Houston by 10points, flipped 2 R+15 congressional districts blue, and that was with low voter turnout/enthusiasm. In addition, many Texas ranchers/farmers/wholesalers were angry with the #TPP reversal. 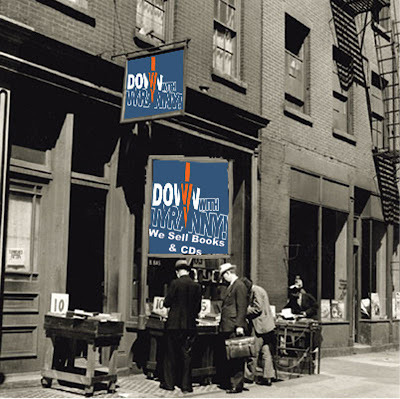 (GOP donor recently quipped...'if the GOP can't support the business community, then what good are they?') Greg Abbot and the GOP, who tout being so 'pro-Christian' also went out churches/charities for being Christian and helping refugees. His actions against them were described as menacing and threatening. Then there are GOP women where many felt the GOP has abandoned them completely. Top it all off, the likely Democratic challenger to Greg Abbott for governor comes from working with the energy industry and can steer away donors and support. Cruz is not going to have any cake walk. He recently showed up for at the Miller Outdoors Theater for Footloose performance (yeah, he's a hypocrite like that bc they're supported by NEA) and was met with loud boos. I think you need to check the date Beto has promised to leave Congress. If he leaves, as you state, in 2020, he will only serve 2 years. Please clarify.